David Wright has been Head of Brass at Charterhouse since 1988, alongside which he has been a musical pillar of the Surrey community. 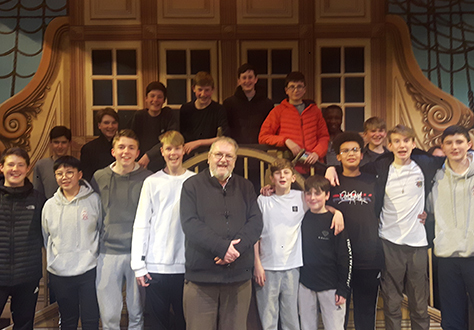 As Musical Director of the Godalming Operatic Society (GOS), he continues a long tradition of Charterhouse staff who have held the baton – in fact, every GOS production since 1925 has been conducted by a member of the School’s Music Department. On Wednesday 17 February, GOS performed the Gilbert & Sullivan classic HMS Pinafore, full of typically witty lyrics and memorable tunes. It was staged in an innovative new production, which included the lesser-known operetta Trial by Jury performed as an ‘on-deck entertainment’ for Captain Corcoran and the ship’s crew, between Acts I and II. The shows were David’s fifth production with GOS; he is also Musical Director of the Godalming Youth Orchestra (with which a number of pupils perform) and Life President of the Godalming Music Festival (which regularly hosts events at Charterhouse). Charterhouse is privileged to partner with a number of local schools and organisations as part of its arts programmes, including annual ‘Arty Mornings’ and a series of regular music assemblies for local primary schools. For more information about Charterhouse’s community and partnerships projects, please e-mail BCN@charterhouse.org.uk. For more information about GOS, please visit https://godalmingoperatic.org/.